How should you brush your child's teeth? How often should your child have a dental check-up? How can tooth decay in children be prevented? Read these simple tips for good oral health for primary school children. From six years of age, use a pea sized amount of standard fluoride toothpaste (unless otherwise advised by an oral health professional). Encourage your child to spit out toothpaste after brushing, but not rinse. Brush in small circles along the gum line. Choose a toothbrush with a small head and soft bristles. Always brush in a circular motion, cleaning a few teeth at a time. Children will need an adult to help them brush their teeth until about 7 or 8 years of age. It is a good idea for an adult to supervise even after children can physically brush their own teeth. Water should be the main drink and children should drink plenty of tap water throughout the day. Remember that bottled water from a shop may not have fluoride in it. Try to avoid sugary foods and snacks in your child’s lunchbox. Foods high in added sugars include jams, lollies, biscuits, cakes, sweet muffins, doughnuts, slices, sweet pastries, chocolate and muesli bars. Enjoy a wide variety of healthy foods from the five groups every day. Milk, yoghurt, cheese (and their alternatives) are an excellent source of calcium. Find out more about free or low-cost public dental services available for school aged children. It is important that school children get to know their oral health professional. Your oral health professionalwill discuss your child’s needs and plan how often your child should have their teeth checked. Your child might not always see a dentist – many other ‘oral health professionals’ such as oral health therapists are fully qualified to work on your child’s teeth. If your child knocks out a baby tooth, do not try and put it back in place. Contact your oral health professional immediately. Trying to replace a baby tooth can damage the adult tooth underneath the gum, or cause problems when it is time for the baby tooth to fall out. hold it by the crown (smooth white part) and avoid touching the pointy root. Gently rinse the tooth with milk or saline without touching the root. Do not scrub the tooth. If the person is conscious, you should gently put the tooth back into the socket. Contact your oral health professional immediately. Custom fitted mouth guards provide the best protection. Take the mouth guard to your dental visits to check it still fits well. 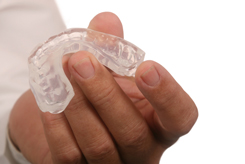 A mouth guard may need to be replaced as changes occur in the mouth, such as when the permanent teeth come through. These tips are based on the Oral health messages for the Australian public: Findings of a national consensus workshop (2010) , the Australian Dietary Guidelines (2013) and the Evidence-based oral health promotion resource (2011) .